The husband and wife team at Imangi Studios and NFL Players Inc. (NFLPI), have announced today that they have partnered up to bring some of the top players of NFL to Temple Run 2. 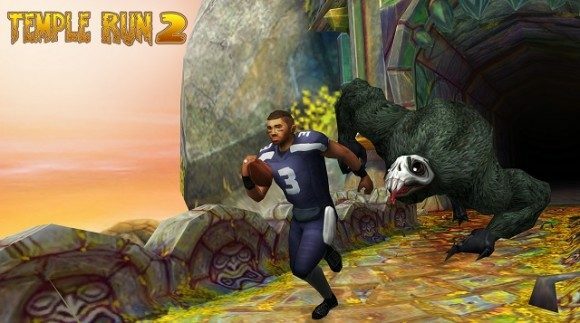 The first one to join in the starting lineup is quarterback Colin Kaepernick and Russell Wilson, and they are both available now to download and play in Temple Run 2 for a limited time only. This is just in time for the Football season, and for the rest of the Fall season, Imangi Studios will select new NFL players weekly for the lineup on Temple Run 2. With the franchise having been downloaded more than one billion times worldwide, you must know about it. If not, then what have you been waiting for? Players take on the role of an explorer who has just went to a temple and just stole an coveted idol, and you must do everything possible to run as long as you can away from that temple and away from the terrifying demon monkey that most likely was the idol’s bodyguard. Though it isn’t as simple to just run away, you will need to dodge obstacles by jumping, moving left or right, or ducking/sliding down in order to miss it. The landscape changes, and every path you take is random, so you will never know what is next. With the Pro Football players in Temple Run 2, you will get to experience them as their real-life persona. Happen to want someone else other than Kaepernick and Wilson? Then you can stay up to date with Temple Run’s Facebook page where you will get to see the latest additions to the lineup of runners, and who knows your favorite one may be coming soon! These NFL Players are a limited time only, but if you do download them, you won’t have to worry about them going away. In order to unlock them, they will cost you just $0.99.